I was trying, really trying, to pick things that were really 'personal' gifts for ME! But apparently I'm not used to asking for stuff, and the things going through my mind now are really for our household. Which I'm a pretty important part of, and this would really make my life easier. 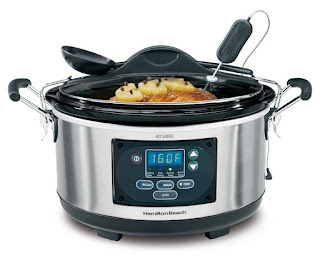 I would really like a programmable crock-pot. The one I have now is not programmable, but is 7-quarts, so that's about the size I'd want. This 6-quart (pictured) apparently got a lot of awards and stuff, and can really get the job done and then some. It's a Hamilton Beach, and even has a built-in meat thermometer. While I don't do a lot of roasts and such in my crock pot usually, it does look cool. My main goals are to be able to set it to come on a few hours after I leave the house for the day, and potentially change the setting after cooking for a bit (for those recipes that say High for two hours followed by Low for four hours, or whatever), and to have it hold the recipes I'm used to making. Probably nothing smaller than the 6-quart, so it can still hold a double batch of chicken dip.